A Reuge 1 tune 18 note pull string music box movement. 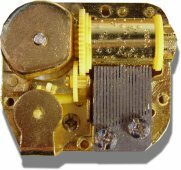 This is a Swiss made Reuge 1 tune 18 note pull string music box movement. This movement is fitted in a plastic housing so that the mechanism is protected should it be inserted in to a stuffed toy. 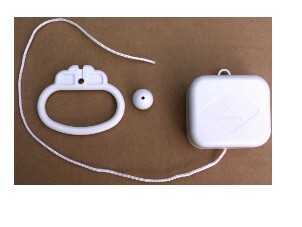 Pull string musical movements are often used in childrens cot mobiles and teddy bears etc. To wind the musical movement you pull the string out then as the tune plays the string is wound back in to the plastic housing. The musical movement comes complete with a pull ball. Approx Size 55 x 48 x 30 mm. Length of tune: 14 - 17 seconds approx (without repeating tune). Total playing time until fully unwound: 2 - 3 minutes approx ( repeating tune). IMPORTANT NOTICE! Please be aware that musical movements do contain small parts. Therefore they are not suitable for use by very small children who should be supervised at all times. If you are unsure about suitability, please ask one of our staff for guidance. These hand cranked movements are great fun. 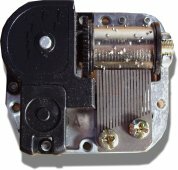 1 tune 18 note clockwork music box movement.